This recipe for crock pot braised beef pot roast comes courtesy of my boyfriend, Sean. He is the biggest advocate of the slow cooker I’ve ever met, and as such, he has quite a few go-to recipes, that I’m happy to let him take the reins on. As I said in an earlier post, I’m not a master of the crock pot having not grown up with lots of meals from it, but I’m slowly getting better and more creative with it, with his help. Anyway, Sean’s a big fan of seasoning the crock pot recipes with anything and everything he had on hand in the spice cabinet, and I guarantee that even though the ingredient list for this one looks long, it’s worth it. He has an excellent sense of taste when it comes to these sorts of things. For a little extra flavor, too, we picked up a pre-marinated pot roast to use in the slow cooker (how can Cabernet marinated meat not make everything better?). With a dash of this, a little of that, and 8 – 9 hours of cooking time, you’ll have a healthy, low-fat, and gluten-free pot roast dinner ready for you. 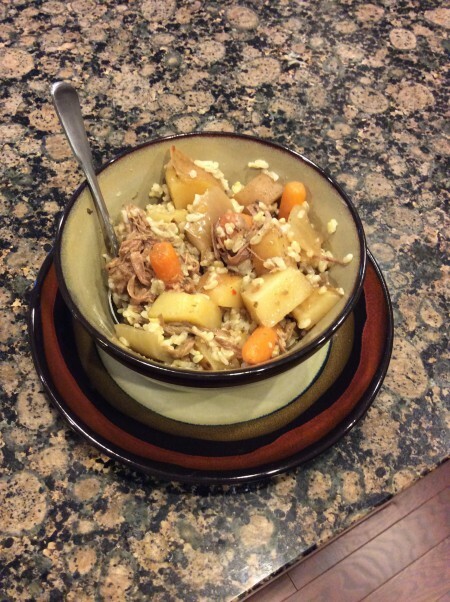 We added rice to the beef stew and veggies to stretch it even further, but if you’re paleo, feel free to eliminate. Whenever I take it to work for lunch, I usually ditch the rice and just eat it as stew. Trust me, it’s delicious and so satisfying. Chop up onion and potatoes into bite-sized chunks. Place onions, carrots and potatoes into a 5- to 7-quart slow cooker, and then set pot roast on top. Season the slow cooker with onion powder, paprika, mustard powder, garlic, bay leaves, creole seasoning, thyme, rosemary, red pepper and oregano. Once seasoned, pour in carton of low sodium broth (the pot roast won’t be completely covered at this time, but it’s okay). Set slow cooker on low and cook for 8 to 9 hours. Once pot roast is cooked through, remove from slow cooker and shred using two forks. Replace shredded meat in the slow cooker and stir into the broth and veggies. If broth seems thin, mix 2 tbsp. of flour with cold water until dissolved and stir into the broth to thicken. Taste broth and add salt as needed. 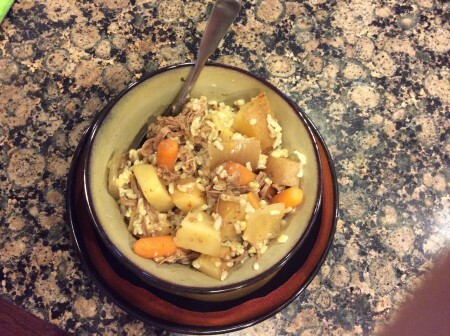 If desired, microwave 3 packages of brown rice according to package directions (makes about 6 cups), divide among bowls and top with slow cooked beef and vegetables. If not, simply divide up beef and vegetables among bowls and enjoy! This low-fat, slow cooked pot roast is big on flavor and low on time and effort.